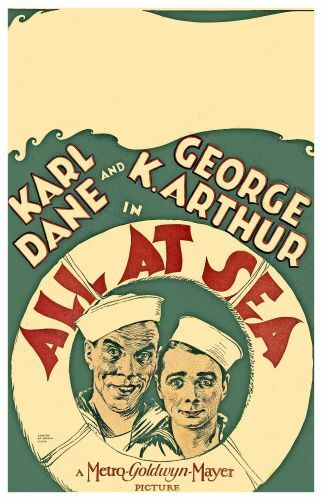 MGM's highly popular comedy team of Karl Dane and George K. Arthur starred in this silly but enjoyable silent comedy in which Dane's goofy gob (named "Stupid McDuff," no less) is hypnotized by Arthur's vaudeville magician Rollo the Great. The rangy Danish Dane and the diminutive British Arthur made a fine team, especially in service comedies. Both comedians found the sailing less smooth after the changeover to sound, however. Arthur's veddy English accent did not suit his carefully built-up persona, and Dane's Scandinavian accent was so thick that it was practically incomprehensible. Their quick fall from grace took its toll especially on Dane, who apparently due to lack of work, committed suicide in April of 1934. The team's usual foil, Josephine Dunn, lent her usual fine support to All at Sea.